LACLEDE., MO: There was nothing about the boyhood of John J. Pershing which would hint of his eventual fame. When his chores on the two family farms were complete, he enjoyed hunting, fishing and mischief-making. In time, along with his brother, he would assume complete responsibility for the operation of the family farms. It was an active existence which would serve him well throughout his life. Pershing would leave Laclede in his early twenties, after being nominated to attend West Point. His travels as an Army officer would take him to various cavalry postings; to Mexico, the Philippines and the Far East. 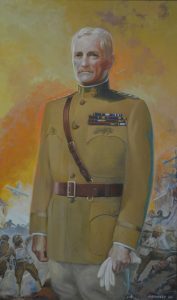 Ultimately, in June of 1917, Pershing would land in war-torn France as Commander of the American Expeditionary Force. He would remain in that position until World War I ended on November 11, 1918. 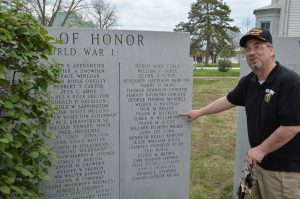 Laclede, Missouri is a long way from the blood-soaked battlefields of France, but it is here, in a white clapboard house, that the story of the Great War’s end actually begins. It is also here, on Saturday, that another important chapter of the war will be eternally remembered. 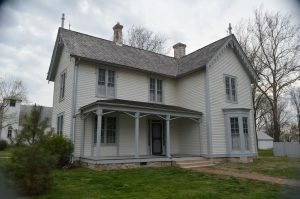 “This house was originally built by a Dr. Harris in 1858,” explained Denzil Heaney: Administrator of the Gen. John J. Pershing Boyhood Home State Historic Site in Laclede. “It was purchased by the Pershing family in 1865. That’s when John – aged six – moved in, and he stayed here until he was 21. After teaching at the nearby Prairie Mound School for a year, he left for West Point in 1882. Heaney said the home remained in private hands until 1947. It was put up for sale about eight months before General Pershing passed way. At that point, the home was purchased by the Pershing Park Memorial Association. The property would again change hands in the 1950s when the State of Missouri acquired the home. “It was dedicated as a Historic Site in 1960. That’s when it was really kicked off as a museum,” said Heaney. Ever since efforts to commemorate the 100th Anniversary of World War I began, nearly a decade ago, Pershing’s four gold stars have been on the rise again. But, for a man who, at one point, was arguably the most famous American in the world, Pershing remains something of an enigma to our current history-starved generation. How did the General get the nickname “Blackjack”? What did Pershing do at San Juan Hill? Did Pancho Villa really get away? How did Pershing build a 2.7 million man army and defeat the Central Powers ~ ending the stalemate of the Great War in 19 months? How was Pershing promoted to the rank of Six Star General – forever making him senior to any other American general with the exception of George Washington? Heaney maintains the museum website, where people can find authoritative answers to these and many other questions. He also oversees the operations of the museum site, which includes Pershing’s white clapboard boyhood home; a second home which houses offices, artifacts, and a small library; and a Pershing statue garden, with granite markers etched with the names of servicemen from various wars. The old Prairie Mound School building is now on the site, too, while a block or so away is another recently acquired structure. But Heany’s real passion over the past few years has been in expanding the museum’s educational facilities and the establishment of a Commemorative Garden which will recognize Pershing’s tireless efforts to honor the fallen Americans of WWI. The garden – now in place – will be dedicated this Saturday, Sept 15, at 2 PM. “What we did for the Commemorative Garden is construct a site with eight individual raised stone flower beds,” explained Heaney. “Each one of those flower beds will contain a portion of soil from each of the seven American WWI cemeteries in France, and from an eighth cemetery in Brookwood, England. Getting that soil wasn’t easy, because they just don’t normally transfer soil. It is hallowed ground. I think the only reason we were able to get it was because of the Pershing connection. “Each plot will be clearly marked as either the Meuse-Argonne, the Somme Cemetery, the St. Mihiel, and so forth. In each plot we will be planting a hybrid of poppies created for us by the Smithsonian Institute’s Horticultural Department. That poppy is a cross between the American Legion Poppy and the Flanders Field Poppy. I’m not a poppy person, but as it has been explained to me, it has a longer blooming season and is a bit hardier for this area of Missouri. Gen. John J. Pershing Boyhood Home State Historic Site will hold a ceremony to formally dedicate its new First World War Commemorative Garden 2 to 5 p.m. Saturday, Sept. 15, at the historic site in Laclede., MO. The public is invited to attend this historic dedication. Gen. John J. Pershing Boyhood Home State Historic Site is located at 1100 Pershing Dr., Laclede. For more information about the event, contact the historic site by calling 660-963-2525.